Cheater Cheater Peanut butter pie eater, this recipe is so SIMPLE it feels like cheating! It gets rave reviews all around. This recipe can be done two ways, one is simple the other is CRIMINAL SIMPLE. If your store stocks Ben and Jerry’s Peanut Butter cup ice cream, you can skip even stirring for this recipe. If not, invest in a good quality pint of vanilla ice cream–I always use Haagen Dazs when I can’t locate the Ben and Jerry’s flavor. Just in time for the Fourth of July and your summer barbecues, this is a sure to please choice. Prepare your crust by dropping 3 TBSP of peanut butter on to the crust and lightly spreading it with the end of you knife. Just the bottom of the pie will do. 3. If you are using the Ben and Jerry’s Peanut butter cup ice cream pint, simply squeeze the pint onto the crust and let it slowly begin to melt until it softens so that you can spread it across the whole pie. Do not worry if it gets quite soft, you will be getting it back into the freezer soon! If you are using Vanilla Ice Cream simply place the pint of ice cream into a large mixing bowl, add your chopped candy and 1/2 cut peanut butter and mix until combined. Dump mixture into the pie crust, spread evenly and move on to step 4. 4. Sprinkle the extra 1-2 chopped Reese’s across the middle portion of the pie, just stay about 1/2-1 inch from the edges so you can add the whipped cream. 5. Place your pie in the freezer until set again, only takes about 15 minutes. 6. Before serving, add the whipped cream around the outside and a puff in the middle. If you are taking this to go, simply do this when it is reset but if you are able to do it RIGHT before serving, it looks prettiest. I am confident you will love it and that I will be making it again soon! First things first you want to marinate your chicken. IF you can find just adobo sauce, awesome, but I often just grab a can of chipotle in adobo sauce and use that. I will keep a chipotle in the marinade for a bit and grill a few for the spice lovers (like me:) Here’s a photo of my precooked marinating chicken. Here are some pictures of our romaine ready to go as well as our “fixing” set aside. 5. Prepare the 1/2 cup quinoa according to the package directions–you can up this if you want a more grain filled dish. 7. While you aregrilling–or your spouse or friend handles that part:), chop your lettuce, avocado, tomato, and red onion (You will notice that I added these items on a seperate plate at our house so everyone could build their own–the photographed (and tastiest if you ask me) salad includes all the ingredients. 8. Whisk together dressing, check the flavor and add salt, lime or honey to your liking–stick in the fridge until you are ready. My husband really loves chicken cordon bleu. 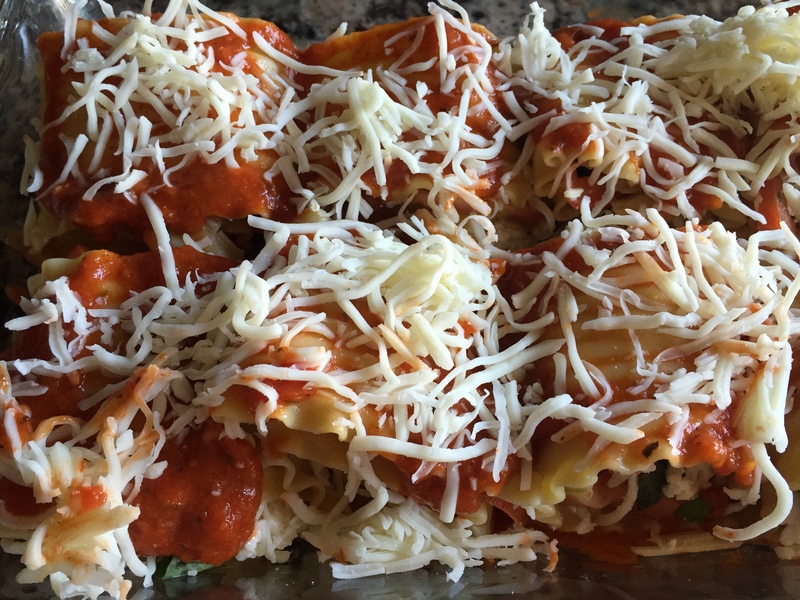 I tried this casserole idea out thinking maybe we could get the taste he loves, the easy recipes I like AND try to cut down on some of the carbs at the same time…he said, this is seriously the best thing you have made in a long time. He likes a lot of what I try, so that is saying something! Go ahead and double the golden round (ritz) crackers if you don’t mind the extra carbs:) You can skip the sauce, but I don’t suggest it…it is AMAZING! Preheat the oven to 350 degrees and coat a 9 x 13 baking dish generously with cooking spray. Layer the chicken in the bottom of the baking dish. Next, layer the chicken with the ham slices and then cover the entire dish with swiss cheese slices. In a medium bowl, blend the crushed crackers, grated parmesan, and salt and pepper. Sprinkle the cracker mixture over the cheese to create the next layer. Pour melted butter over the top of the casserole and bake for 30 to 35 minutes until juices run clear and cracker crust is browned a tad. Sauce: the last ten minutes your chicken is cooking you should start your sauce. Melt the butter in a saucepan slowly. Next, slowly pour in the chicken broth and milk. Whisk continuously for 5 minutes or until the sauce thickens. In an attempt to cut down on all the super tasty carbs pre-bathing suit season, I tried out something different last night in the kitchen, it was delicious and ALL FIVE PEOPLE in my house liked it, WHAT??? The best part is that I had ALL the ingredients on hand. No trip to the store, for once, for me! Brown the ground beef and drain it. When 1/2 way browned add the garlic powder and the salt and pepper. Stir in 3/4 cup (1/2 the total) of the shredded cheese, leaving 2/3 cup aside for the top later. Stir in the bacon, cut into pieces, I just sliced each piece sideways in about 1/3 inch strips. Place the meat mixture into 2 9 inch pie pans. Next, whisk together the mayonnaise, half and half and eggs. Pour the mixture over the meat and top with the remaining cheese–add a bit more if you feel it is not fully covered. Now just bake at 350 degrees for 30-35 minutes or until bubbling. A MUST–Take out of oven and let stand for 5-10 minutes before serving. This was super good warm last night, but made tasty COLD lunch today too!! I have to tell you, I would have loved adding some dill pickle slices on top near the end but my pickle averse family would have protested–an idea for you though! Sometimes it is hard to come up with new recipes…so many things are just too complicated for week night or include ingredients a) my family won’t eat or b) are not going to mesh with my hopes of providing healthy dinners. So, sometimes it is best to experiment a little bit with old recipes to turn them into something I feel good about feeding the family. The great thing about this recipe is that is low carb, full or protein and veggies AND MY WHOLE FAMILY LOVED IT! It also took hardly ANY TIME! The most involved part was washing my mini food processor. I like the mini as it is a much easier endeavor to take out and clean up. I am behind on posting, so let’s get to the details! In a large skillet over medium heat, brown the beef until cooked through–this will take about 10 minutes. Depending on the beef you used, you may have some oil left in pan. Remove the meat and reserve 1 TBSP of oil, I used 93% and had much less than that remaining so added a TBSP of olive oil to the pan before the next step. Return pan to heat and add onion, salt and pepper. Cook until the onion is translucent. This will be 4-6 minutes. Now add 1/2 clove or 1 tsp. of minced garlic. Yes, I buy the handy glass jars sometimes. Now, return the meat to pan. Stir arrowroot starch (or cornstarch if you have it on hand instead) into the wine and then add the mixture to the pan. Cook for about 5 minutes, you will see most of the wine has been cooked away and the mixture has thickened. Now stir in chopped rosemary and remove the skillet from the heat. You may add additional rosemary if you love the flavor, I kept it low as I knew my kids would enjoy some flavor but pick around the leaves themselves. As your beef is browning (if you have not already done the chopping) create you florets. FYI, I used one medium head of cauliflower or about two cups of florets. The head itself weighted 2 lbs. Steam your cauliflower (a steaming basket is best, but you can boil it as well as long as you remove as much water as possible when it is complete). This will be ready in about 6 minutes–drain it and add it to your food processor, I used the mini so I did this in two batches. Transfer to a bowl and add your butter (melted), salt, pepper and another 1/2 clove or tsp. of minced garlic. Put you beef layer into the bottom of a 9 by 11 baking dish and then spoon your topping layer over the top evenly. Sprinkle the cheese over the top and bake for 20 minutes. At the 20 minute mark, switch to broil for 3-5 minutes or until the cheese is bubbly and just starting to brown. Cold weather, cold/flu season, busy nights, entertaining–you NEED this recipe! 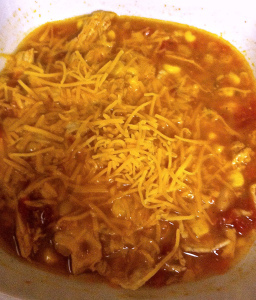 Super Easy Super Yummy Super Tortilla Soup ! Perfect for your Super Bowl party!! Holy Cow! This was delicious! It’s no mistake that I am using this recipe right before the Super Bowl! It is the perfect warm, filling, tasty BUT healthy dish! This was one of those weeks where experimenting was going to be tough, too little time and too much to do. I remembered once attempting a similar soup and decided to make my weekly experiment improving on it…I did! Are you ready for the BEST part??? 2016: Week 2! Steel Cut Oats & Quinoa Oatmeal “Bricks” Make, Freeze & Microwave–Trader Joe’s Copycat! I LOVE to have a nice warm healthy bowl of oatmeal on a colder morning and my kids like it too. The combination of the steel cut oats and the quinoa in this recipe keeps you full ALL MORNING LONG! I added a bit of flax seed and will add chia next time as I as out when I made it this time around. The kids say they when they eat this in the morning they don’t get hungry before lunch (that is some BRAIN FOOD for school!) and I enjoy it the mornings before a long run and it helps sustain my energy the whole way through. I used to buy the frozen brinks at Trader Joe’s. At our local TJ’s the steel cut only version is $1.79 a box (just 2 servings) and the oat and quinoa version is $1.99 a box (also 2 servings). That meant for one morning, 5 of us, I need 2 1/2 boxes. That’s a lot of freezer space. So, I decided to experiment and make my own. It was AWESOME! I “worked” the very same way, took in from the freezer, popped in in our microwave, boom! Breakfast! Here are a few ways we have enjoyed this so far, let me know if you try any great combos! So, how do you do it??? Cook both the quinoa and the steel cut oats according to the package directions–for the quinoa rinse first and then 1 cup water to 1/2 cup quinoa works great. I do these two at the same time. Two burners going at once, can you say multi-tasker?? Once they are cooked, combine the oats and the quinoa in a bowl. Stir in the seeds, maple syrup and brown sugar. Put the muffin pan in the freezer. Once the “muffins” are frozen, bring the pan out to sit for about 5 minutes. Use a fork to gently remove each “muffin” from the pan and place in a freezer safe container or ziplock bag. Remove 2 “muffins” from the freezer and place in microwave safe bowl. Add 1 tsp of water to the top of each frozen muffin. Microwave for 1 minute, break up and stir. This is a snap to prepare, tastes great, looks pretty darn good and is good for you, too! WIN WIN WIN! It is the first of the year and I am guesses more than a few of us are committing to healthy lifestyle choices, or trying anyway! This salad makes that easier! We actually liked it enough to make it TWICE this week. Another awesome thing about Kale is that is lasts longer in the fridge! Most salad gets all wilty but kale stays nice (maybe even better) even with dressing for awhile! Place the 4 cups of kale into your large mixing bowl and drizzle it with olive oil; use your hands to spread the oil throughout the kale. Massage the kale with your fingers for a few minutes (this can help cut down on the bitterness). Prepare the quinoa according to the package directions (I cooked 1/2 cup with one cup water to achieve my 2/3 cups cooked). When it is finished, allow it to cool to room temperature. While the quinoa cooks, chop your avocado into smallish pieces, set aside. Add the cooled quinoa, avocado and tomatoes to the kale. Toss gently. Add vinaigrette (if desired, you can cut fat/calories here by simply adding extra lemon if the flavor suits you–my kids like the french vinaigrette flavor and if they eat kale salad, I am willing, happily, to comply. I DO NOT like ricotta cheese. 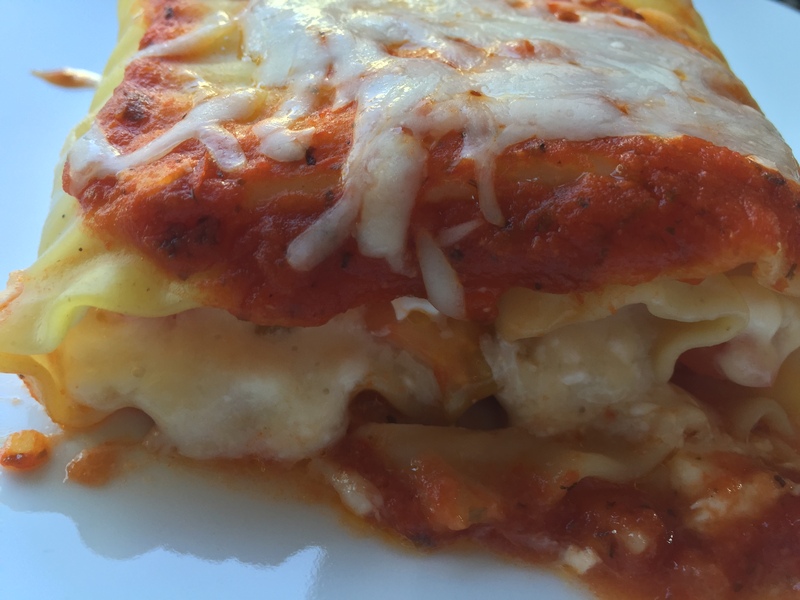 I love lasagna, but I omit ricotta every time and sub in fresh mozarella or cottage cheese. I saw a lot of Caprese Roll up recipes going around, but I had to make one without the ricotta and see what it was like. 1.Cook the lasagna noodles according to package directions but be sure to keep them a bit al dente. 2. Drain pasta and place the noodles in a single layer on a large sheet of wax paper. 4. Prepare your filling: In a large mixing bowl, Mix about 3 cups of the Mozzarella cheese, egg and parmesan and season with ground black pepper to taste. 5. Spread a thin layer of the cheese mixture over each lasagna noodle, be sure to cover the noodle completely end to end. 6. Lay about 4 thin tomato slices over the cheese mixture and then place fresh basil leaves (about 3 each noodle) over the top. 7. Roll lasagna noodles to opposite end, make them nice and tight. 8. Spread a thin layer of marinara sauce in the bottom of a 11×7” baking dish. 10. Sprinkle the remaining shredded Mozzarella on top. 11. Bake at 350 degrees for 30 minutes. Remove the dish from the oven and garnish it with more fresh basil.